You may have an old piece of furniture that has interesting lines but that is in poor condition. Before you decide to get rid of it, you can bring it up-to-date and add a modern twist by applying spray chrome to it. Imagine that wooden table with its currently gouged and scratched top instead covered with a layer of gorgeous chrome. Think about adding chrome touches to the seats or back of chairs to match the now beautifully unique table. You can turn an old and tired piece of furniture into an interesting centerpiece for your room. Here’s how you can spray chrome your furniture. Begin by sanding the surface smooth using your sandpaper. You can manually sand it or use an orbital sander. If there are any gouges, fill them with filler or putty and allow it to dry. Re-sand to make certain that the filled area is smooth and flush with the surface. Finally, apply a good-quality primer to the surface you will be chroming. 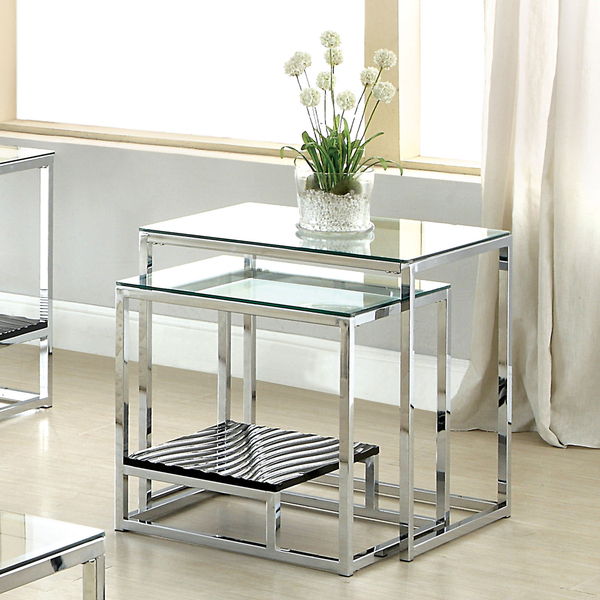 Chroming your furniture involves a few steps. When you follow them, you’ll have a beautiful result. After you have mixed these solutions in the provided bottles, set them aside. To mix your base coat, mix together your 2KA basecoat together with your 2KB hardener. To this mix, add 20 percent of the volume in your black 2K reducer. Then, apply the basecoat using fast, side-to-side even sprays. Make certain to work from the bottom of the piece to the top. Let your base coat cure for 24 hours. After you have finished applying it, clean your spray gun with acetone. Next, you are going to spray your sensitizer, which is the W solution that you mixed. Liberally spray it all over the surface immediately followed by your D solution. Rinse the surface with deionized water, and then repeat the W, D and deionized water applications. Before letting the surface dry, immediately apply your chrome spray using side-to-side movements, working quickly from the bottom to the top. Continue until you have your desired finish and shine. Make certain to blow off any water droplets on the surface. Your topcoat is mixed by mixing together your 2KA topcoat together with your 2KB hardener and the 2K clear reducer. Apply this using quick side-to-side sprays, again working your way from the bottom to the top. The topcoat will be fully cured at room temperature in about 48 hours. What about chrome spray paint? You may have seen cheap bottles of chrome paint at your local hardware store, and you might wonder why you can’t just use that instead of PChrome spray on chrome. Chrome paint that is sold in cans is simply a silver spray paint. It does not give you the same shine that you get from traditional chrome plating or from PChrome spray on chrome. It also will not last for very long, and it may easily wear, flake or peel off over a few months. PChrome gives you a highly durable, thick coating that has the mirror-like finish that you expect to get from chrome. You can get started on your furniture restoration project today. Call us at PChrome to order your kit, or simply submit your order online.